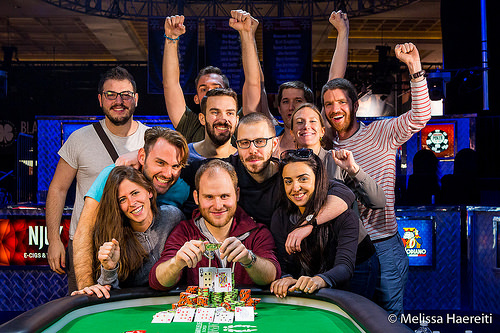 Sam Greenwood is the latest gold bracelet winner at the 2015 World Series of Poker being held at the Rio in Las Vegas. He’s the first Canadian champion of this year’s series. The Toronto-based player won the $1,000 buy-in No-Limit Hold’em tournament, which was the 21st gold bracelet event on this year’s schedule. Greenwood topped another huge field of 1,915 players on the way to the biggest payday and most prestigious prize of his poker career, to date. His victory paid $318,977 out of the total prize pool of $1,723,500. Cheered on by a loud rail of spectators, including several other poker pros, the player who describes himself as a “poker enthusiast” rather than a poker pro, played very much like a skilled veteran, managing a bold comeback against Cole Jackson, who appeared to be the player to beat, but couldn’t maintain his momentum in the tournament’s closing stages. Greenwood’s humble outlook on the game and his role in it was refreshing and even a bit of a surprise. Even winning the prized gold bracelet didn’t seem to be his primary objective. “Things really worked out for me tonight. I won most of my pre-flop all-in raises, my made hands got paid off – that’s what it takes to win one of these,” he added. Second Place: Cole Jackson, from Seattle, WA finished as the runner up. This was his highest and most lucrative WSOP finish to date, worth $197,254. The 23-year-old poker pro cashed for the second time this year, also making the money in the Millionaire Maker tourney. This marks seven series cashes since his first appearance here at the annual classic back in 2013. Third Place: Ken Weinstein made his second final table in as many years and third WSOP cash overall, collecting $136,380 for 3rd place. Weinstein is from Chatham, NJ. Fourth Place: James Dorrance, from Hershey, PA finished 4th, which paid $98,360. Dorrance won the WSOP Circuit Main Event in Chicago two years ago, one of the largest championship fields in the 10-year history of the Circuit. That 2013 win paid more than $400,000. This was his best WSOP score in Las Vegas, and perhaps a sign of even more future success. Fifth Place: John Myung, from the Washington, DC suburbs finished in 5th place. He’s a longtime tournament semi-pro who has cashed in numerous events, including 31 times now at the WSOP. Yet, he still remains without a gold bracelet. Myung, did pocket $71,904 in this, his sixth final table appearance here at the series. Sixth Place: Sean Rice, a 25-year-old wealth management advisor from Cherry Hill, NJ came in 6th. 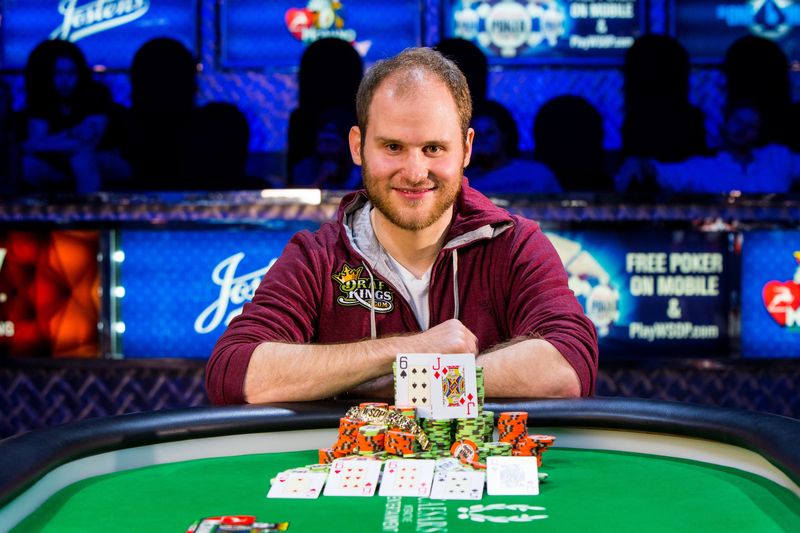 He picked up $53,256, the highest payout he’s achieved at the WSOP to date. This was Rice’s second final table appearance in 2015 following an 8th-place finish in the Turbo No-Limit Hold’em tourney a few days earlier. Seventh Place: Aaron Belardo made $39,967 for finishing in 7th place. This was his first series in-the-money finish. Eighth Place: Robert Hsu, from Plano, TX made his first WSOP cash in this event, earning a very respectable $30,385 for his 8th place finish. Ninth Place: Jay Dragland rounded out the final table by finishing 9th. He collected $23,387 in prize money. Dragland is 23-years-old and resides in Calgary, Alberta (Canada). Gold bracelet winner and 2009 Ladies World Champion Lisa Hamilton cashed in this event, finishing 15th. Multiple gold bracelet winners who cashed included – Dan Heimiller (2 wins), Barry Shulman (2 wins), Antonio Esfandiari (3 wins). Cole Jackson makes it 160,000 to go. Sam Greenwood comes along. The flop comes . Greenwood checks. Jackson bets 150,000. Greenwood fires back and raises it to 400,000. Jackson calls. The turn comes . Greenwood bets 575,000. Jackson shoves all in. Greenwood snap calls. Greenwood yells to his friends on the rail "He's drawing dead!" The river comes . Greenwood takes it down with flopped trip sixes. Cole Jackson is eliminated in 2nd place and takes home $197,254. Sam Greenwood wins Event #22 $1,000 No Limit Hold 'em and gets to take home $318,977 and a coveted World Series of Poker gold bracelet. Cole Jackson calls a raise of 165,000 from Sam Greenwood, and the flop comes . Jackson checks to Greenwood, who bets out 220,000. Jackson raises it up to 640,000, and Greenwood calls. The turn is the , and Jackson moves all in. Greenwood folds, and Jackson wins the pot. Cole Jackson bumps it up to 160,000, and Sam Greenwood calls. 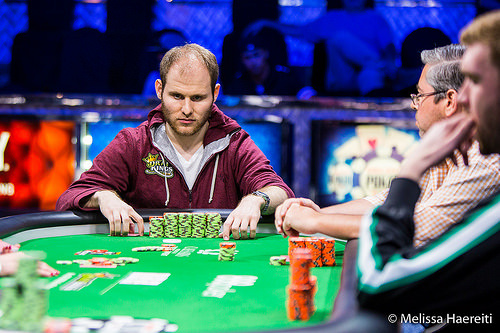 The flop comes , and Greenwood check folds to a bet of 185,000 from Jackson. Sam Greenwood makes it 190,000 to go, and Cole Jackson calls to see a flop of . Jackson checks to Greenwood, who fires out 150,000. Jackson folds, and Greenwood takes the pot. Cole Jackson raises to 160,000, and for the third time in five hands, Sam Greenwood three-bets to 475,000. This time Jackson calls, and the flop comes down . Greenwood continues with a bet of 515,000, and Jackson calls. The comes on the turn, and both players check. The river is the , and again, both players quickly check. Greenwood tables , and Jackson shakes his head, rechecks his cards, and sends them to the dealer. Greenwood takes another pot, and extends his chip lead. Sam Greenwood makes it 165,000 on the button, and Cole Jackson makes the call. Both players check the flop of , and the same happens on the turn. The river is the , and Cole Jackson fires out 210,000. Greenwood calls, and Jackson mucks his hand. Greenwood has to show a winning hand: for just queen high. It's good enough to take the pot. Cole Jackson raises to 160,000, and for the second straight time, Sam Greenwood three-bets to 475,000. Jackson folds again, and the pot goes to Greenwood. Sam Greenwood folds, giving Cole Jackson the pot. Cole Jackson makes it 160,000 to go, and Sam Greenwood three-bets to 475,000. Jackson folds, and Greenwood takes the pot. Sam Greenwood raises to 165,000. Cole Jackson calls. The flop comes . Both players check. The turn comes . Jackson checks. Greenwood bets 200,000. Jackson calls. The river comes . Greenwood fires out 500,000. Jackson calls and shows for a pair of sixes. Greenwood has nothing with . Jackson takes it down. Cole Jackson makes it 160,000. Sam Greenwood lets it go. Sam Greenwood raises to 160,000. Cole Jackson calls. The flop comes . Both players check. The turn comes . Check, check. The river comes . Both players check the river. Greenwood shows with a ten high. Jackson mucks his cards. Cole Jackson raises to 120,000 on the button, and Sam Greenwood three-bets it to 360,000. It's back on Jackson, and after a minute or so of thinking, he announces "810,000." Back to Greenwood now, he thinks for about 90 seconds before announcing all in, a bet of 3.135 million. Jackson gets the count, thinks for a minute or so, then calls to put Greenwood at risk! Both rails start shouting for their respective players cards, as the dealer gets ready for the flop. Those three cards are the , and Greenwood shoots out to the lead. Jackson is hoping for a third six, but they never come, as the hits the turn, and the hits the river. The two players virtually trade chip stacks, as Greenwood now has 6.3 million to Jackson's 3.2 million. After that hand, the two players take a break. Action will begin again shortly. Sam Greenwood makes it 130,000 to go, and Cole Jackson calls. The flop comes , and Jackson check calls a bet of 260,000. Both players tap the felt after the turn, and the same occurs on the river. Jackson tables for two pair, and Greenwood mucks. Cole Jackson raises to 120,000, and Sam Greenwood makes the call. The flop comes , and Greenwood check folds to a bet of 135,000 from Jackson. Sam Greenwood raises to 130,000, and Cole Jackson folds. Cole Jackson makes it 120,000 to go. Sam Greenwood calls. The flop comes . Both players check. The turn comes . Greenwood bets 250,000. Jackson folds. Sam Greenwood raises to 130,000. Cole Jackson calls. The flop comes . Greenwood bets 160,000. Jackson folds and Greenwood takes it down.